Heated Up! : Thermoelectric Wood Stove, Solar Power, and a Floating Cabin! All about heating with wood: wood stoves, pellet stoves, wood heat policy, tax credits and incentives for wood heat, etc. 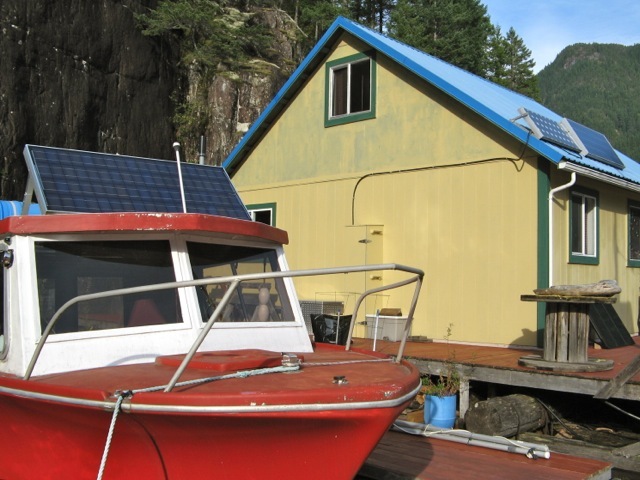 Thermoelectric Wood Stove, Solar Power, and a Floating Cabin! Finally this winter, our thermoelectric wood stove generator is fully operational. Following our test runs, we placed the pump to recycle cold water down in the lake water under the cabin. In winter, it gets about 5 degrees C (41 F). That's plenty cold for a good differential between the 300 degrees C on the hot side. 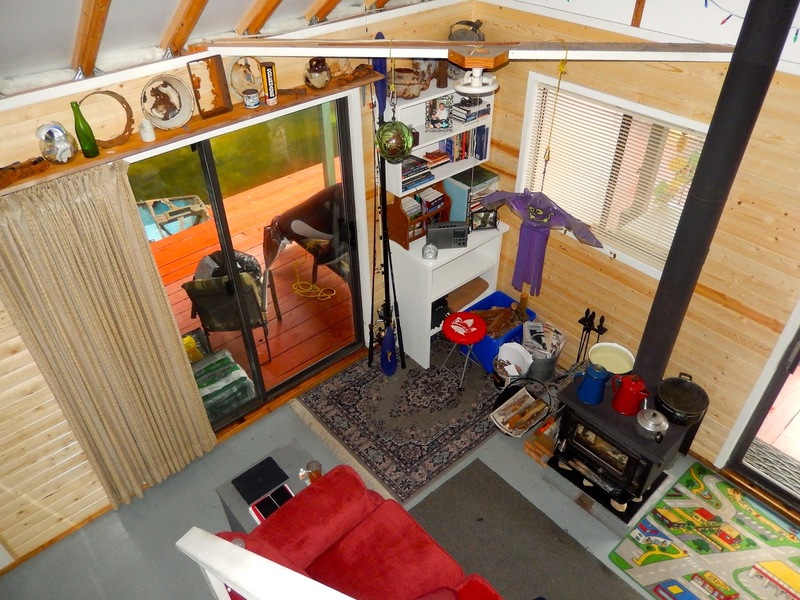 Most system owners don't live in a float cabin four feet with a constant cold water source under the floor. The typical user has to use a recycled liquid (usually including a water/antifreeze mixture) that runs through a radiator for cooling. 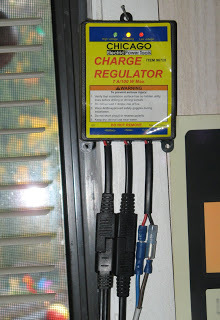 In addition, a charge regulator/controller is used to protect the batteries and prevent overcharging. The model that came with our system has lights to let you know the status of the charging process. Wayne likes to know more about the charge we are getting. He installed an ammeter and a volt meter. The switch in the middle controls the water pump down below the cabin. 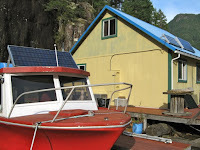 To maximize the charge to our cabin battery bank, we've installed a separate solar panel and two six volt batteries wired in a series to run the pump. I have a nearly infinite supply of very cold water 4 feet below my wood stove. 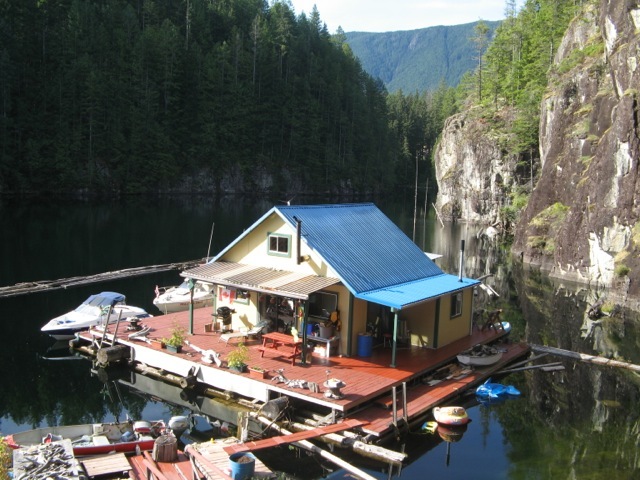 I live in a floating cabin on Powell Lake BC, and the lake is extremely deep and very cold in all seasons. What an opportunity to serve as a source of cold water through the cooling system! The pump only needed to pump the cold water up 4 feet and then outflow back into the lake. Even with this tremendous advantage, I couldn’t get everything fully operational. Does this make me a non-believer in thermoelectric from a wood stove? Absolutely not — I still believe this is an important future source of electrical power in my cabin, since even a top-off voltage during the solar-depraved Canadian winter would be worth the price. I’d be one of the first in line if a recreational property thermoelectric system was available, and I’d be quick to try again. Thus, I wish you all of the best with your preparation for the 2018 conference. I’ll be following the results closely. 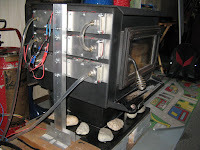 In an earlier post, Wayne reports that he is using three 25 watt thermoelectric generators for a total rated power of 75 watts of output, however, he’s only getting 23 watts of power for his battery. Part of this is due to his pump, which is drawing almost 22 watts of power. If you are interested in building your own thermoelectric wood stove, there are a few improvements that you may want to consider. First, TEG suppliers (see our resources page) now sell more efficient lower wattage pumps. Second, consider starting with a thermoelectric generator rated for 100 to 200-watts. While this is more expensive, if you go with a smaller system much of your power will be consumed by the pumps and/or fans you need to cool the modules. Third, Bellville washers are critical for allowing the modules to expand and contract. If you are interested in designing a thermoelectric wood stove for our 2018 Wood Stove Design Challenge, please visit our web site for more information. 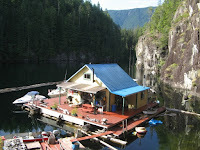 For more information on Wayne and Margy’s life on a floating cabin, please visit their blog at Powell River Books Blog. For an overview of the potential of thermoelectric wood stoves, click here. The Solar Power is considered as the new energy for us and it is green power for the environment. We should encourage more people using it in the life. Sign Up for Our Free Monthly E-Newsletter!